Single Leg Calf Raise is a dynamic exercise that effectively targets the calf muscles but can also engage the core muscles when performed as a free-standing bodyweight exercise. This is a great way to individually develop each calf muscle and make sure there are no strength imbalances between them. Significant strength imbalances can cause injury not just to the calf but to the compromised side. You will get better results by following a high rep program when exercising calves. Assume a shoulder width position. Tighten your core, place your hands on the hips and hook one foot behind the other leg. Raise your calf by pushing on the floor with the ball of your foot. Hold the top position for a count of “one”. Another version is to place one foot on a 5 cm to 10 cm block, hold on to a support and raise your calf by pushing on the block with the ball of your foot. Hold the top position for a count of “one”. Resist your bodyweight and bring your heel back to starting position. 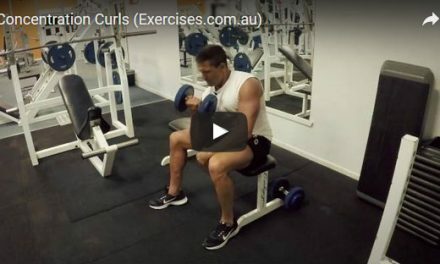 Once you have completed the targeted number of reps on one calf, switch and work on the other calf. Perform the exact number of reps. 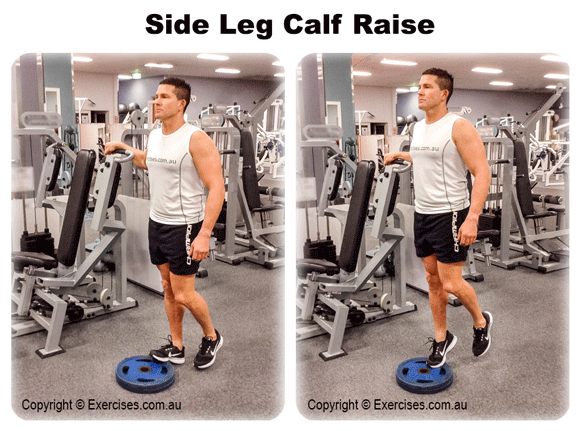 Single Calf Raise is all about balance, a strong contraction at the top and a good stretch at the bottom. To get the most of this exercise, focus on the quality of each rep rather than the total number of reps.
Switch foot positions so you can target different areas of the calf muscle.